At the end of every The Price is Right show, Bob Barker (and now Drew Carey) likes to remind us that we should spay and neuter our pets to help control the pet population. Well, we did just that last week with William. He's now less of a man, but hopefully he will be calmer and (not that I would have minded) he will not be a father to any baby springer puppies. Contractually his breeder required that we do this and the operation is also something that helps to calm male dogs down and reduce aggression. William definitely needs some calming down. 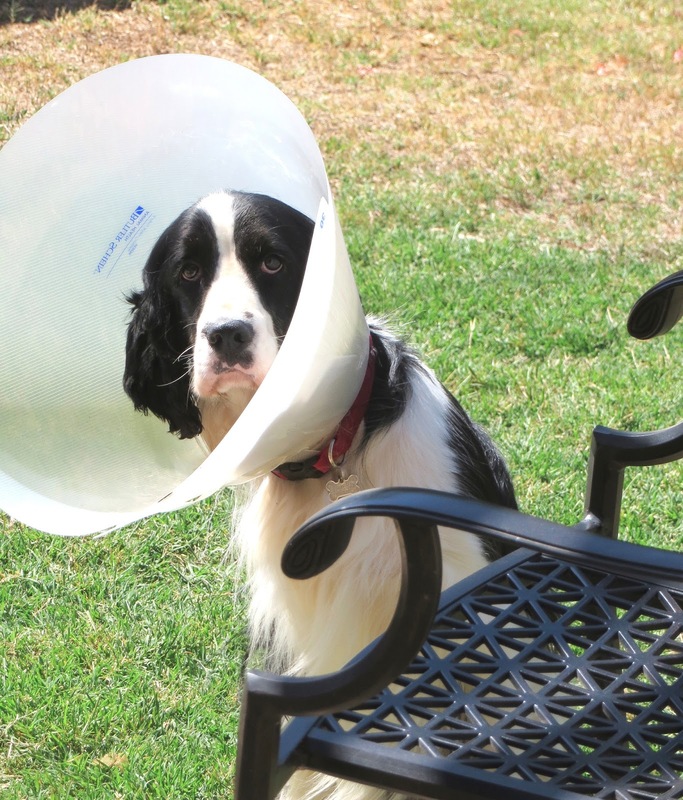 If it wasn't bad enough that he is now not all "intact" with his man parts, he was also issued a big lampshade cone which you will see him sporting in the pictures below. The whole ordeal for obvious reasons was quite humiliating for him and we are trying not to laugh too much when William collides into furniture and doors due to the enormous cone attached to his head. William hopes that you all have a wonderful weekend. No matter what you are doing, I guarantee that it will be better than his! Although, he is on a bunch of sedatives and pain meds, so maybe it won't be all that bad. Haha! It is most definitely the "cone of shame". I think it's coming off today.